View our interactive map of natural and architectural heritage sites throughout Trinidad and Tobago. This map, like much of this web site, is a work in progress that relies on engaged participation by both academic researchers and "citizen archivists" in order to grow. Help us fill in the blanks (i.e., buildings in disrepair or old images of completely demolished structures) by uploading them here. You're also welcome to create features on your favourite places, as well as the people associated with those spaces, and we'll be happy to share them on the site. Drop us an email with your feedback or to let us know if you have any specific locations you'd like to see featured. Chacachacare is an island in the Republic of Trinidad and Tobago, located at 10° 41' north latitude and 61° 45' west longitude. The island is 3.642 km² (900 acres) in area. It is one of the Bocas Islands, which lie in the Bocas del Dragón (Dragons' Mouth) between Trinidad and Venezuela. Chacachacare is the westernmost of the Bocas Islands which belong to Trinidad and Tobago. Patos Island, which lies further west, was part of Trinidad and Tobago until 1942, when it was ceded to Venezuela. 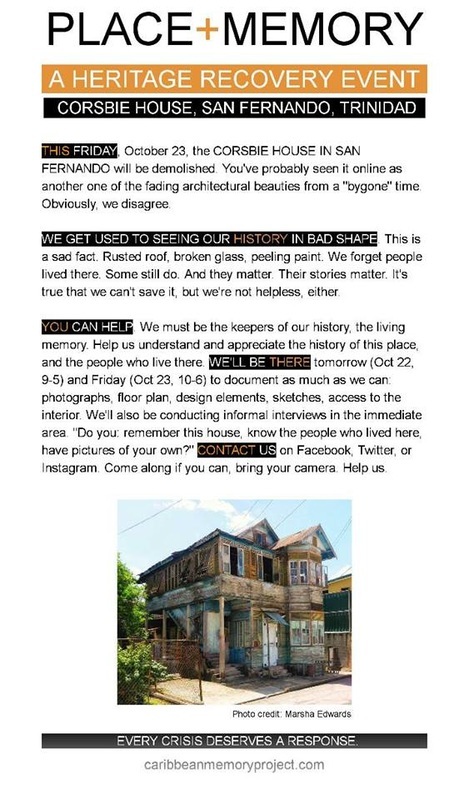 In late October 2015, the administrators of the Caribbean Memory Project learned via social media of the impending demolition of the Corsbie House, located at 114 Crosby (sic) Street, San Fernando. While the demolition rumours were incorrect, we took the opportunity to spend some time in San Fernando gathering stories and memories of the building from remaining neighbours on the street, passersby, and people from the wider community who shared our concerns that such a wonderful example of our architectural history might be lost.